My name is Edwin Espinoza Sotelo, along with my parents (Marino Espinoza, Mercedes Sotelo) and my sister, Flor de María Espinoza Sotelo, we belong to the community of Mollepata, Soraypampa, where we begin to hike the Salkantay trek. In total, we are a community of 12 local families, from the start of the Salkantay route of the Peruvian Andes to the ancient Inca citadel of Machu Picchu. You will have the added bonus of understanding the culture and traditions of each family en route. Our commitment is to provide you with a really exciting trekking experience for all of our guests in a safe, responsible, socially sensitive and environmentally friendly manner. There is no other travel agency or travel company who manage us, we are native to this area and can offer this service to you, directly with the aim of giving you the highest quality service. We will show you our culture, traditions and historical ancestry, working with nature and in harmony with the flora and fauna of the area. Our philosophy is that the more that people know about us and our way of life, the more you will feel like part of our community. The hike is safe and is not technically difficult. All you really need is change of clothes for your own comfort, everything else is provided. We will be happy to give you more information about what to bring with you. Throughout the years, we have worked with many travel agencies, for example providing services to them for their customers, providing mules to carry their belongings, and have offered our homes to the Travel agencies, with the hope that their customers would buy chocolate bars, snacks or a bottle of water from us. The reality unfortunately is that these travel agencies have slowly destroyed our houses and even left their garbage along the Salkantay route. However it is because of this that we have learned some valuable lessons and we have learned how best to receive our guests. Through hard work with other travel agencies, we have been able to learn about how the service should be offered, to be able to offer a good quality of service without causing damage to our environment. 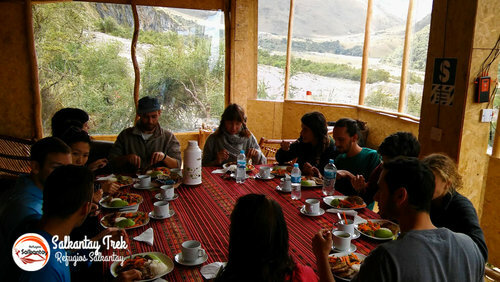 It is for these reasons, Refugios Salkantay is able to offer a service based on quality, innovation and creativity. Even though we do not speak English perfectly, we are able to interact and communicate with our customers to the best of our ability. In one way or another, we make sure that our clients understand us and the details of the trek. Despite our cultural differences and language barriers, we have spent many an evening having a wonderfully, entertaining time with many laughs and good times at the dinner table! The office of Refugios Salkantay can be found in Mollepata at the start of the Salkantay route. Salkantay trek.